Got some fun stuff coming throughout this series, some of the best stories of the year. I'm looking forward to this! It's been almost 30 years since my last Toledo playoff game. I know it will not be anything like it was back in the day, but it's good to see old rivals go at it again full force. I think the K's can win this round, they just need to stay out of the box, hit hard and win some face offs! Keep control of the puck as much as possible and don't give up too many odd man rushes. Control your temper, no matter what, and don't take stupid penalties, even if the ref is an idiot! If Szyd and the rest of his line, and anybody else for that matter, can score a few goals along the way that would be great too. Keep Will in goal for us and get to Lerg early on. If everyone steps up and does their part, the K's will be moving on to the finals. I can't wait! Go K's!!! "but he's playing golf now." might be the best line I've read in a long time! It would be nice to keep the ratio of O-zone penalties to D-zone penalties to less than 1. I'm suppose to be keeping down my blood pressure, and stupid penalties in the offensive zone drive me nuts. It would also be nice to avoid sloppy changes, too many men and all other unforced errors. Looks like Wheeling has layed out the blueprint on how to slow them down. We have to be physical with them. They are tired from playing a hard fought 7 game series and will get no rest. We definately have the speed and skill to skate and score with them but i don't think that they can play the physical game like we showed that we can against Kzoo. Why let them off the mat? We don't need all the slashing and cross checking but we do need to hit everything that moves, keep the front of our net clear, and get some traffic in front of their net. We can't afford to get into a special teams battle with them, but my fear is that we will not play physical because we are afraid of penalties. We have had way more time to gameplan, work on our special teams, and rest. Best chance to steal home ice back is game 1. Let's be aggressive and take it! Toledo had, basically, 200 fewer penalty minutes than the K's. They had a 24% powerplay. They have the "home ice" advantage (and I don't care what anybody says, knowing game 7, if needed, would be played at home is huge). Toledo has more team speed. As Komet fans we've been hearing this "stay out of the box stuff" all year long. It's really important but I don't expect this team to change its personality overnight. I'm pretty sure that nobody in the Toledo locker room is looking past this series. They just about got eliminated by Wheeling, winning the 7th game of the series (at home!) in overtime, by scoring a shorthanded goal. Do you think that might be a little "wake up" call?? Not sure about Crowder's condition. But they will need that 2nd line producing. The Komets can skate, but I believe Toledo is a smidge quicker. Maybe Toledo will come into the series fatigued. Tough 7 game series with only a day in between. I'm thinking Will is the goaltender (but remember that he gave up 8 goals in the last two games at Kzoo). How do the Komets respond having so many days "off"? The K's need to "steal" one. Yeah, Alan, they had a great PP rating, but in the head-to-head series (7 games) , Toledo had only two more PPs (and two more PPGs) than the K's and no PPGs in the last 5 games (0-19). For the season overall, they had a grand total of 9 more PPGs than the K's. They were feasting on somebody on the power play, but it wasn't us. If the Komets take as many cheap penalties against Toledo as they did against Kalamazoo, they will lose this series. That's been a major topic of conversation in the dressing room this week. Check out the third period penalties against the Wings. Those can't happen. Thanks, RonFWA. Those are revealing statistics. Maybe I'm just plainly wrong. Wouldn't be the first time nor am I afraid to be wrong, but I still fear that particular part of the next series. As Blake alluded, they have been talking in the locker room about penalties (maybe we could say discipline) but it doesn't seem to improve. You can't control how a referee is going to call a game. Szydlowski got called for a dive (terrible call, in my opinion) and Barteaux got an interference for sending a stick down the ice (stupid thing to do). But both got two minutes. The penalty kill hasn't been the strongest part of the K's game (again, in my opinion), but a dramatic reversal will be needed in this series. The one thing, I think, that has improved has been the willingness to get in front of the net. 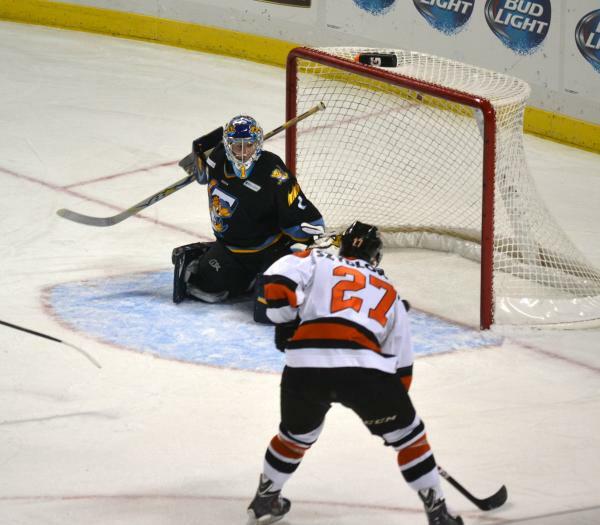 The komets had an awful lot of good chances that were stymied by Martin. Again, I'm probably wrong, but I think the k's can get to Lerg easier than to Martin. I'm hoping Crowder can get back in the lineup. The second line needs to keep shooting and scoring. Crowder, not only a threat to score and be a playmaker, is essential for faceoffs. That statistic (15-1-2 after the Luciani trade) is remarkable. I thought that the Komets had a real chance of finishing in first when the trade was made. Instead, Toledo got better. There are a lot of side stories to this series. Maybe that's the way it is supposed to be between the top two teams in the division. Well, I'm going to give it a "rest". Time to be concerned who the Bengals will take at #21 tonight! Look at the last two games in the third period against Kalamazoo, Ron. Komets CAN NOT get those kind of calls against Toledo. Toledo is a lot more talented than Kalamazoo, power plays are night and day. Toledo will hurt them if they get those kind of chances. I would feel better about Komets' PK with Luciani not playing for the Walleye, but different guys have stepped up now. If PPs are even or close, Komets have a lot better chance in this series.